This story is not the worst that I’ve been in trouble in my lifespan, but it was the first. It was then that I realized that there are rules to be followed and consequences to be paid for not obeying them. Rule #2: If you break Rule #1, feign ignorance. Rule #3: If Rule #2 fails, don’t say another word. There are more rules, but I’ve forgotten them now since I’ve never broken Rule #1. Well, that’s not exactly true. I have broken it, but not as far as the law is concerned. The first time I broke Rule #1, I was only five years old. My grandmother was a home economics teacher. She sewed a lot of our clothes when we were little. She was pretty damn good at it, too. The only way you’d be able to tell that they were knock-offs and not the real deal was the missing branding, which could be why I hate wearing anything with a conspicuous brand today. Anyway, I’m already off point. When I was five years old, my grandmother took me to the fabric store as she was wont to do. I had to go so that she could size the patterns on me. It was the most boring place in the world for a child and she spent what seemed like hours there. I had to find ways to occupy myself in a fabric store. It’s a difficult prospect for an adult who doesn’t sew; it’s an impossible task for a five year old. My reward for this drudgery was going to the penny candy store next door afterward. Some genius had placed these two stores together. They must have had a grandmother who sewed their clothes, too. As we’d walk to the fabric store, I’d eye the candy store with its sign proudly displaying a giant penny. It was so close, but still so far away. My grandmother knew the carrot and stick method well. If I kicked up a fuss at the fabric store, she’d take away the trip to the candy store. If I behaved myself, a candy paradise awaited. I always behaved myself. I liked to play with the buttons. They came in so many shapes, sizes and colors, and they fit nicely in my little hands. They were smooth and cool to the touch. One day, they got some new buttons in. They looked just like pennies. Now, I’ve never been very good at math, but I knew what a penny was, thanks to the giant sign outside the penny candy store, and I knew how much it was worth in candy from previous visits. It didn’t occur to my tiny child mind that maybe these weren’t real pennies, but just buttons shaped like them. In my mind, they were the equivalent of candy. I decided to embark on a criminal career and swiped them. I hid them carefully in my little dress thinking that I could get a few extra pieces of candy with them. How clever I am! When we got to the penny candy store and I selected my sweets for the day, I grabbed a few extra, just as many as my buttons would pay for. We made our way to the register and my grandmother pulled out her change purse. I pulled out my buttons. As my grandmother set the coins on the counter, I slapped down mine as well. I looked up at her with a proud grin on my little face, not to find a look that praised my cleverness, but to find a face full of horror. She took me by the hand, leaving all my carefully selected candies behind, and marched me back over to the fabric store. I still had no idea what the problem was. She explained to me that those were not, in fact, real pennies, but penny-shaped buttons. She also explained to me that I was a criminal. I had stolen from the store. How would I like it if someone stole from me? I was bad – very bad. The lady at the fabric store had a good giggle. Fortunately, she had no intention of sending a five year old off to the clink and accepted my apology. I cried the whole way home. I cried because my grandmother was angry. I cried because I knew I was wrong and guilty and bad. 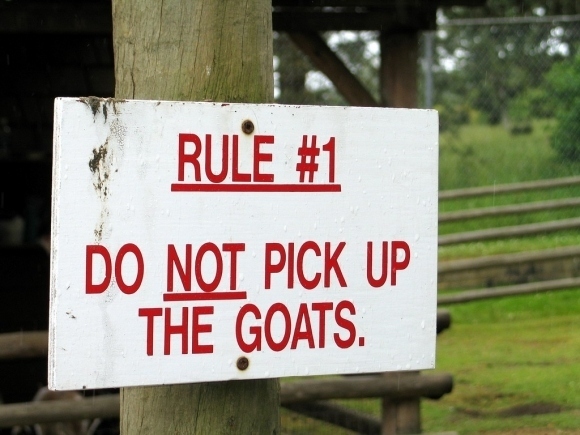 I cried because my burgeoning criminal career was at an end and I had broken Rule #1. I cried because I knew that I wouldn’t get my candy that day. Posted in stories and tagged shenanigans. Bookmark the permalink.